The other day Mike and I went on a massively long walk. The sun was gorgeously bright, the sky was a brilliant winter blue and the air was crisp but not too cold. It was one of those rambling walks where we didn’t have a destination in mind – we were just walking, talking, and taking in Tokyo. Eventually we realized we were hungry and upon this epiphany, I realized that my feet were throbbing a little. It was definitely time for a snack and a drink or two. We found a cute little cafe that had an early bird happy hour going on so I had a couple of deliciously freshly-squeezed grapefruit chūhais. If you haven’t had a chūhai before and you like light fizzy drinks, you’ll LOVE chūhais. I’m obsessed with shochu highballs! Have you had them? They go down really easily, but like most deliciously light drinks, if you’re not careful, you’ll drink entirely too many and end up very, very drunk at a laughably early time of day. True story. Afterwards, our inebriated selves (okay, my inebriated self) decided we HAD to go shopping so I dragged Mike to the dollar store. “Dollar store?” you might be thinking. Yes, the dollar store (it’s actually a 100 yen store). Dollar stores are amazing in Japan. I can’t get over how many amazing things they can sell for a dollar. The majority of the items are quality made in Japan products. I’m talking about awesome kitchen goods like ceramic ginger graters and customizable alphabet cookie stamps. I’m a true dollar store fanatic and that’s when I’m sober. Imagine how I am in a dollar store with my inhibitions lowered. What I did end up doing, while I was slightly intoxicated, was come up with this burger. I wanted a burger, I wanted grilled cheese and I wanted an egg on top of it all. 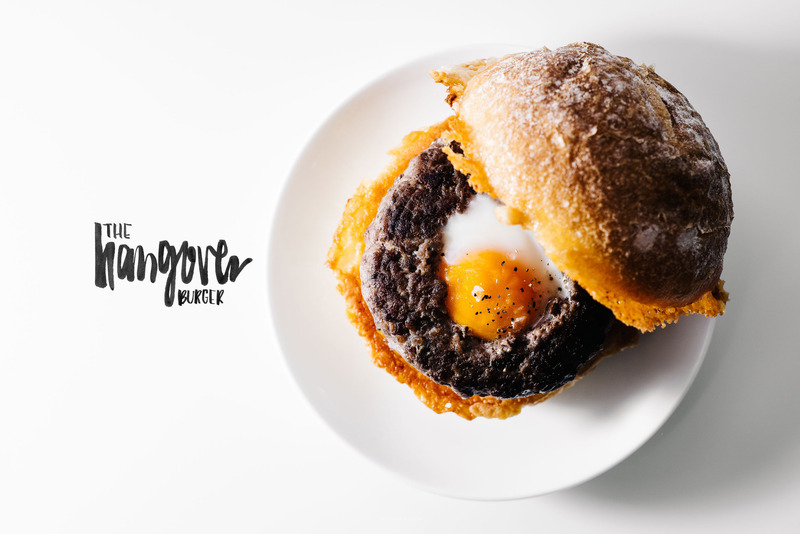 Behold, the ultimate hangover brunch: a medium cooked egg with a still slightly gooey yolk inside a burnished burger patty on top of frico style grilled cheese buns. Seriously heaven. Bonus: My feet felt great after I bought the ramekins. Start off by shaping the ground chuck into a patty, being sure to pack it together fairly tightly. Season both sides of the burger generously. 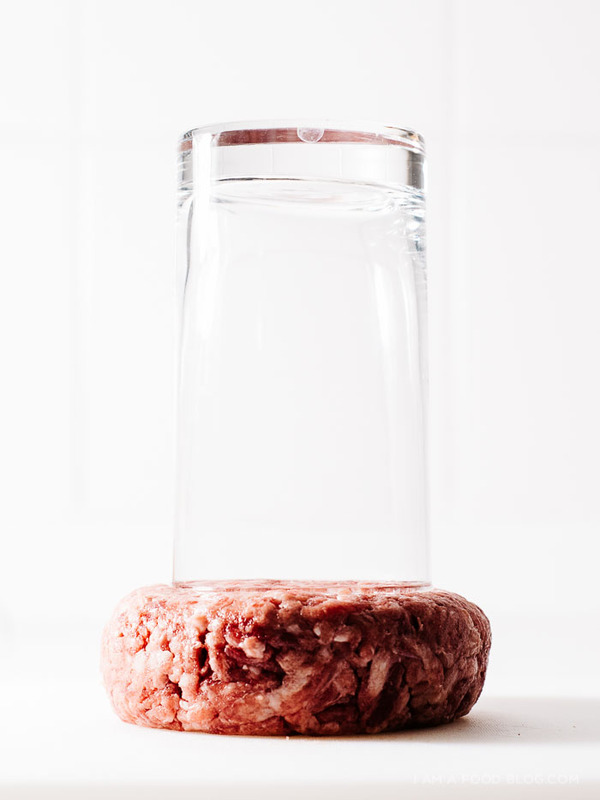 Take a small glass and cut a hole out of the middle of the burger. Break the egg into a ramekin and set aside. Preheat a heavy cast iron skillet over medium high heat and add the burger patty with the hole cut out. Cook until browned and crisp on one side, 1-3 minutes. While the burger is cooking, start to frico grill cheese your buns. Sprinkle 2 tablespoons of shredded cheese in the rough shape of your burger bun. Add the bun on top and grill on medium-low until the cheese is crispy and golden. At this point, you should check on your burger. Check using a spatula and when brown, carefully flip the burger. Pour the egg into the hole – if it looks like the egg while will overflow, hold it back and reserve for another use. Cook on medium-low, covered (use a glass lid if you have one so you can see) until the egg is done to your liking. While the egg is cooking, frico grill cheese the other side of the bun. 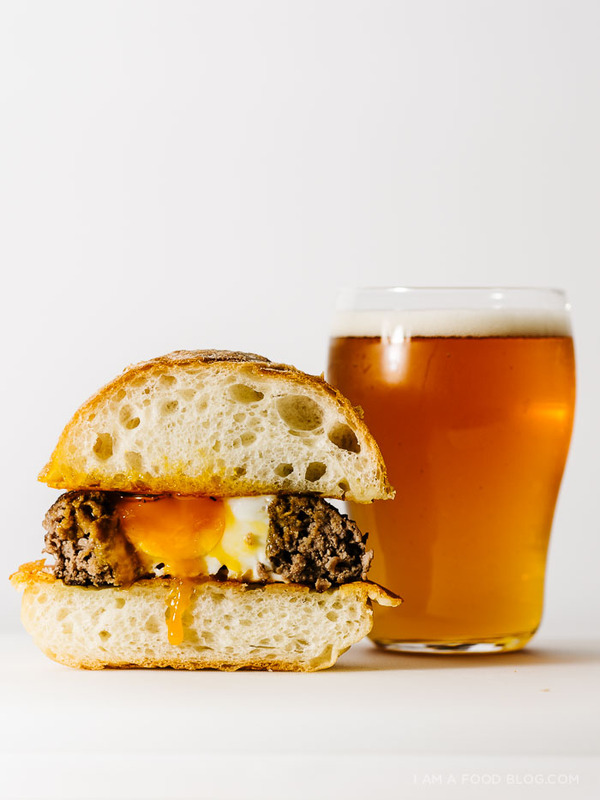 When the burger and egg are done, season with salt and pepper and place on top of your grilled cheese buns. Top with any toppings desired and enjoy! I kept mine plain and simple with ketchup for dipping. Don’t forget to fry up the tiny burger to eat as well! Notes:If you really are planning to be hung over, it might be helpful to have a designated brunch maker. 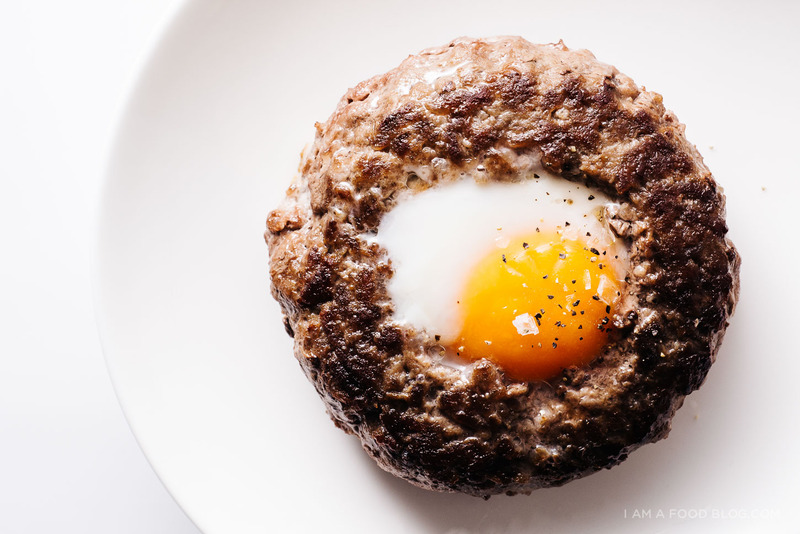 Or you could pre-prep your burger patties and even your eggs. Trust me, your hung over self will thank you for taking care of business the night before. It’s not so easy to elegantly break eggs into tiny burger holes when you’re hungover and all you want to do is stuff food into your mouth. 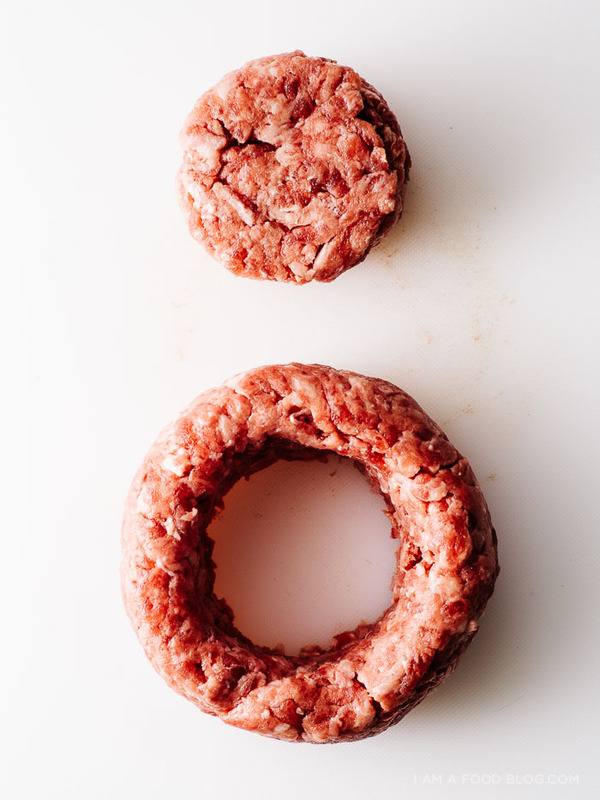 Just shape the burgers, wrap them in plastic. Don’t forget to crack the eggs in to small bowls too! Yess please! This is definitely vegefiable and down right delicious. Yum! Love this Stephanie!! SO easy and delicious! Hello, Steph! 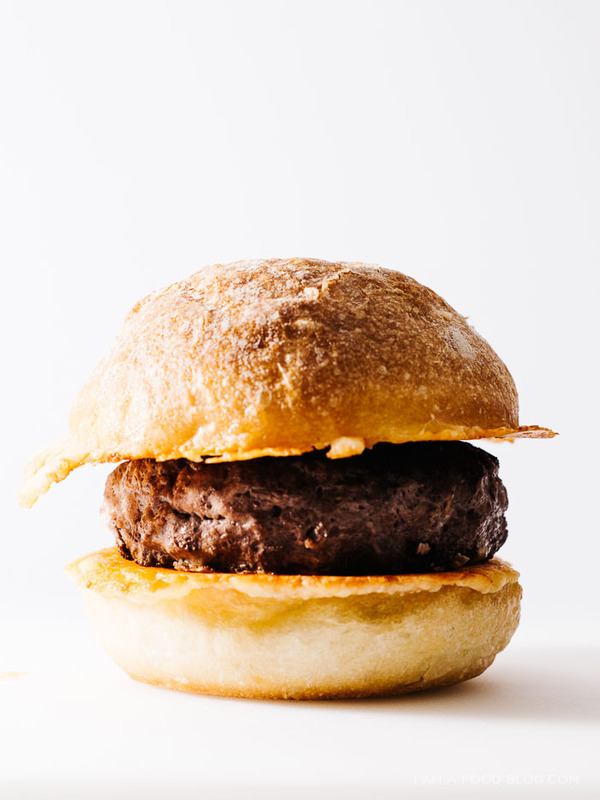 This burger recipe is so great, I’m definitely giving it a try real soon. By the way, have you and Mike moved to Tokyo for good? I might’ve missed out on the announcement earlier but it seems like you did. What an amazing thing to do, be it a permanent move or a very long vacation. I left my heart in Japan when we visited last year! Ahhh this looks FANTASTIC! I am totally craving a burger (this burger!) right now!! 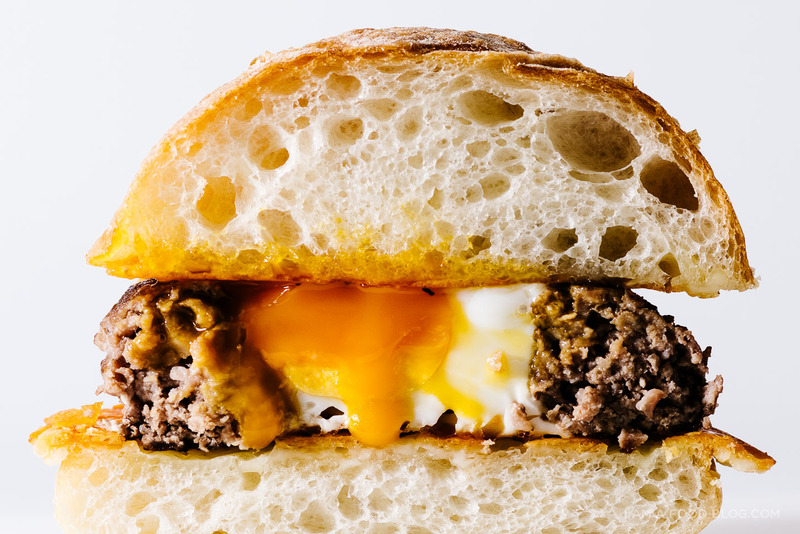 This burger — MIND BLOWN. Also, I love dollar stores too! When I lived in SF, my office used to be right next to this Japanese dollar-store type place. Things weren’t a dollar, but they were pretty close and good quality! I got several madeleine pans there that I still use today; I’m sure your minimini ramekins will come in handy soon. 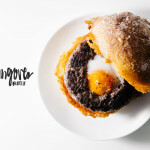 I’m pretty much in on any recipe with an egg on top, but this. This! Over the top delicious. This would cure even the meanest hangover. Genius! Love shochu!!! and everytime my BF goes to Osaka I send him to the 100 yen store! He bought me some really cute Hello Kitty makeup bags that sell here in Hawaii for over $8.00 and also lots of great nail polish! Now this is an amazing and beautiful thing! I really want to see a picture of the ramekins now. In my mind they are so tiny that you could make teeeny chicken pot pies in them and eat them all. That mini? No? Okay :) love this recipe Step and the story is fist bumpin awesome too. Make more drunk food. 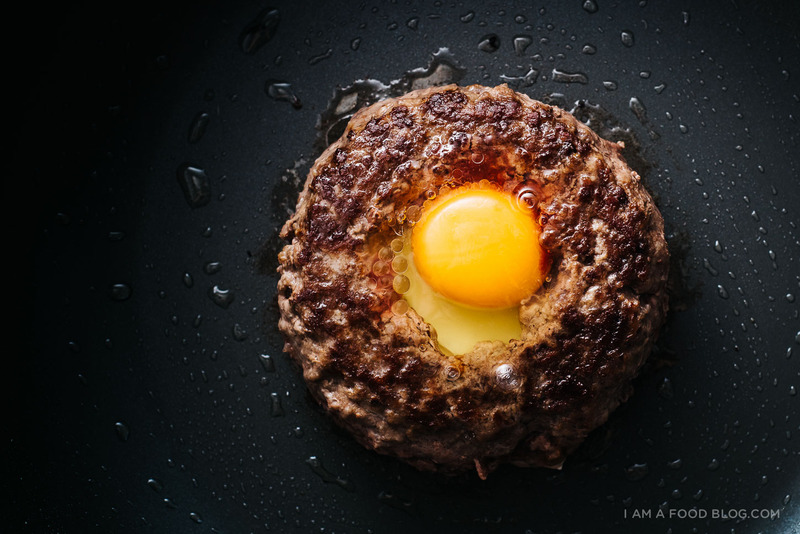 Putting the egg inside the burger instead of on top seems like such a perfect and natural choice, yet I don’t think I’d ever seen it before. I’m stunned by your precision in designing such a universally appealing brunch item for hungover people everywhere! Man, oh man do I love a good dollar store. I’ve got a couple of favorite mexican dollar stores near my house that I love walking around in. I can usually find some really cute enamel kitchen stuff. The only thing I can’t get over is that most of them sell colored contacts… for your eyeballs…. at the dollar store. Also, I need this burger in my life. I love this for so many, many reasons. The story. The ramekins. Gooey egg. Burger. Perfection! Pinned. Stop. Just stop. I may or may not need this NOW! Steph, this is pure glory. The story is so adorably cute and the recipe…ahhh so dangerously yummy!! HOW IS THIS BURGER REAL LIFE?! OK. THIS! This may just be the best thing I have ever seen. Ever. Very cute! I do egg in a bagel and I call it “a hole in one”. My daughter loves “crisp cheese”. Thanks! Are you kidding me?!? Everything here looks amazing! Well I plan on eating these tonight with the family while completely sober. I love how you take simple ideas and mash em’ up to make a great, gourmet looking thing. I also love your book. So many great recipes. We have cooked several so far and they have been delicious. Your coffee cake and coddled eggs (two different recipes) are my favorites so far. Oh. My! This is brilliant! And I love your brunch idea – we Calgarians have a thing for standing in line all morning for brunch, but I don’t – let me stay in my PJs! 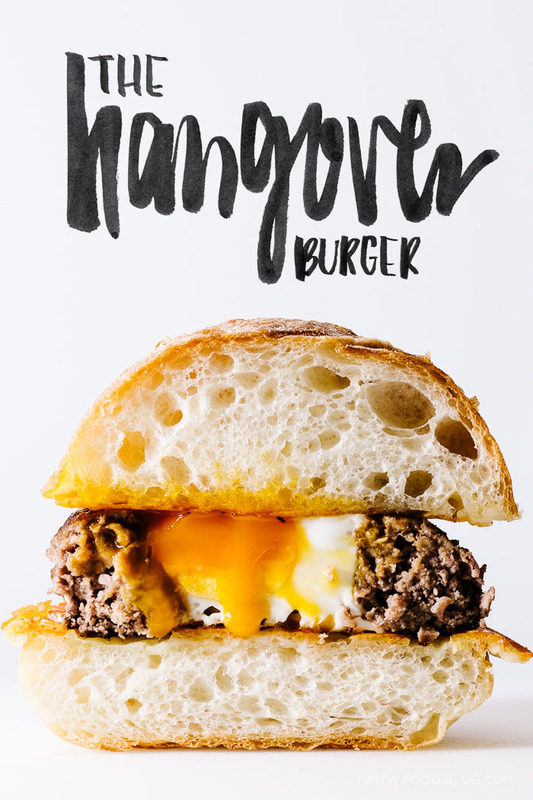 The perfect hangover cure! Great for an easy student meal, looks delicious. This is the most beautiful, savory-satisfying creation I’ve ever seen! I can’t wait to get this in my belly AS SOON AS POSSIBLE! Nice! going to try next time! Perhaps add some bacon,… hmmm, bacon! Okay like to try this. Like my burgers medium and my eggs over easy. What would my còk times be? i’m not sure, because it’d depend on the thickness of your burger and size of your egg and the hole, etc. 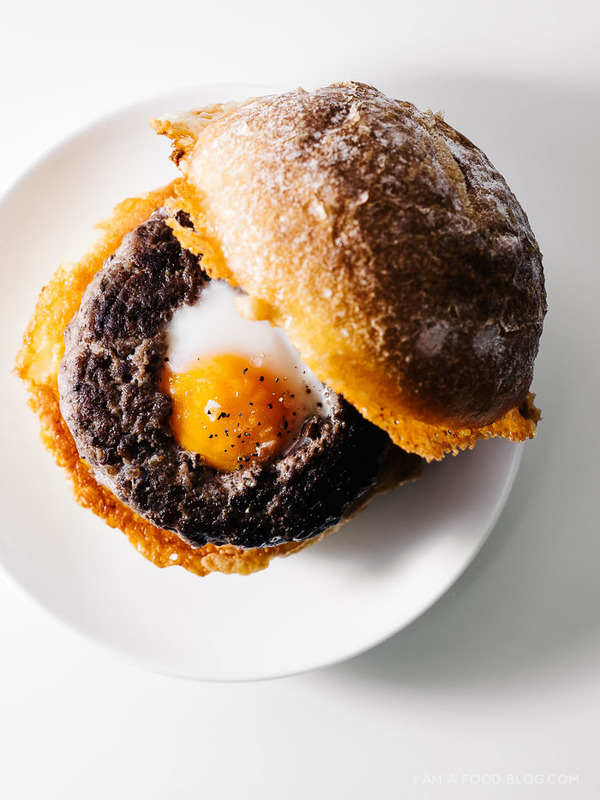 if you cook the burger then add the egg, let it cook for 30 seconds then flip and cook for another 30 it’ll still be a very runny yolk, if that’s what you’re looking for. hope that helps!